Wafer decorations. Perfect for Easter and Springtime Bakes. Each pack contains 12 daisies. No artificial colours. No hydrogenated fats. Suitable for vegetarians. 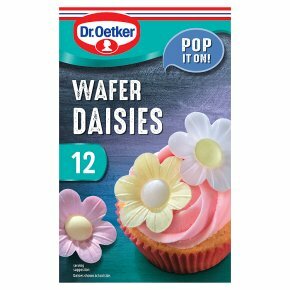 Dr. Oetker Wafer Daisies are perfect for springtime and Easter bakes. Made from edible wafer paper, these cake decorations bring cupcakes and cakes to life with very little effort. Each pack contains pink, yellow and white daisies and are true to size. For best results place on icing just before it sets and on desserts just before serving.